For use with all Super PVA mops. Designed to organize mops, brooms, and other stick goods. Simply insert handle into slot. The gravity controlled, rolling ball with rubber rings automatically adjusts to the handle's thickness and grips it securely. Compact 3 position is perfect for small apartments, laundry rooms, and broom closets. Dimensions of holder: 11.20" x 3.25" x 2.75" (h). Weight: .70 lbs. 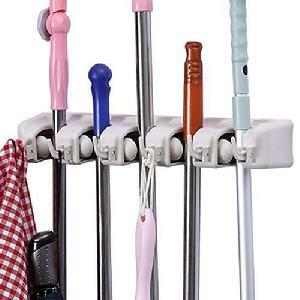 335-0003 - The Super Magic Holder for Mops and Brooms - 3 Position - $14.95 each - Now Just $9.95 each - a $5.00 Savings! For use with all Super PVA mops. Designed to organize mops, brooms, and other stick goods. Simply insert handle into slot. The gravity controlled, rolling ball with rubber rings automatically adjusts to the handle's thickness and grips it securely. The larger 5 position is suggested for laundry rooms, garages, utility rooms, offices, workshops, and warehouses. * Dimensions of holder: 17.5" x 3.25" x 2.75" (h). Weight: 1.28bs. * Hardware and instructions included for easy mounting to walls. 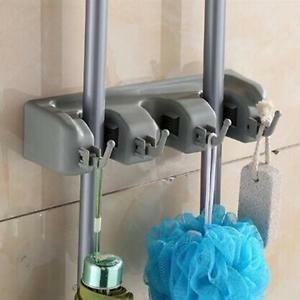 335-0005 - The Super Magic Holder for Mops and Brooms - 5 Position - $19.95 each - Now Just $14.95 each - a $5.00 Savings!